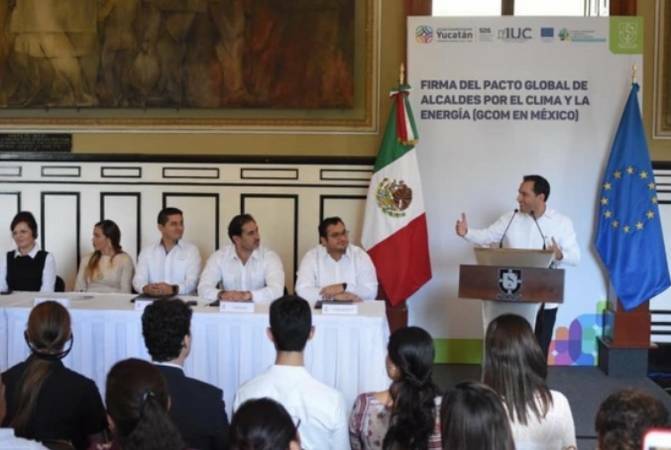 The start of 2019 saw a Global Covenant of Mayors (GCoM) Signing Ceremony take place at the Government Palace of the State of Yucatan in Merida (Mexico). As part of the ceremony, 10 Yucatan municipalities were added to the 36 cities that were already part of the Global Covenant of Mayors in Mexico. Around 80 mayors from cities that have not yet joined the movement were invited to learn more about the GCoM. In addition to the ceremony, IUC North America organised a Technical Meeting attended by Elise Abbes, Regional Coherence Officer with the GCoM Secretariat in Brussels (Belgium) and facilitated by the IUC Programme’s Salvador Rodriguez. During the meeting Arch. Edgardo Bolio Arceo, Director of the Municipal Planning Institute of Merida, presented Merida’s cooperation with its European counterpart, the City of West Athens (Greece), as part of the IUC programme. The pairing has been cooperating since October 2017.